Trench for one of two new walls. THE LADS started work on the storefront Monday morning, and they’ve arrived here daily at 8 a.m. Much progress has been made. Above is a foundation trench for one of the two additional walls that will box in the area that currently is walled on just two sides. The trench has been half-filled with cement. It’s drying. 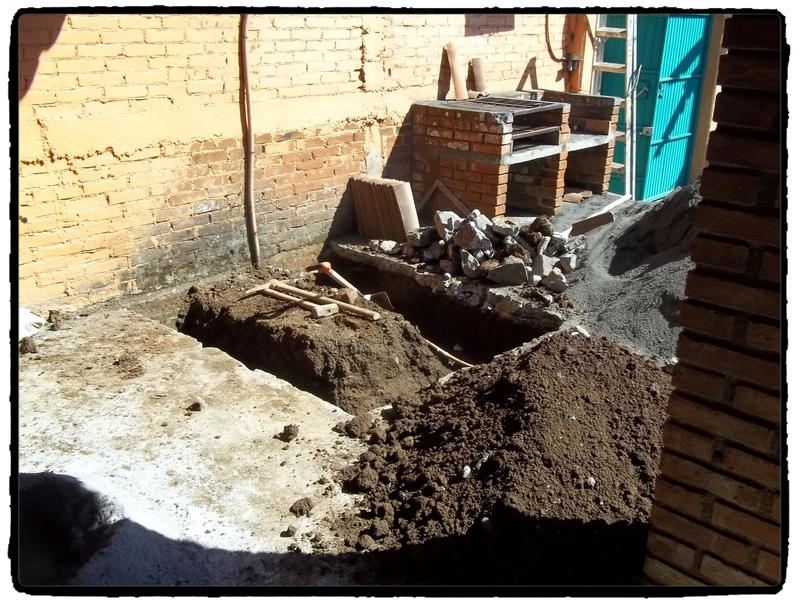 Below is the excavation for the foundation of the half-bath that will abut the storefront. The bathroom, a john actually because there will be no bathing there, no shower, will be the only part that will reside outside the already existing tile roof. The john will have a flat roof and the water tank will sit up there. There are some unrelated details around the Hacienda that the boys will complete too. One is to remove that brick grill you see in the bottom photo. It was here when we bought the property 13 years ago, and we’ve never used it. Another is to replace the red tile roof above the green gate (top photo). That’s almost completed. Fast work. That roof over the entrance gate was installed just last spring by a different workman. He did a crappy job, and tiles easily slipped this way and that. The new guys are cementing them in place. In the top photo, you can see an old-style fuse box high on the wall just under what will be the storefront roof. Two metal conduits are leading to it. There are only two fuses in there, and it’s where the Hacienda electricity comes in from the street pole. That will be replaced with circuit breakers and moved somewhere to the right, which is to say outside the storefront. An ongoing photo album of the work can be seen here. It will be updated often until the work is finished. Watching this is great fun for me. If only I didn’t have to pay for it. The large rocks/boulders came from or are going where? Parkprin: I don’t know specifically where they came from, but we live in a rocky, mountainous area, so getting rocks is easy. Where they are going? They’ll be part of the foundation, I’m guessing. Your first time here. Comments are good. PS: The rocks that are too large will be busted into smaller ones, I imagine, and tossed into the foundation trenches, which are quite deep. That cannot be seen in the photos, the trench depths. 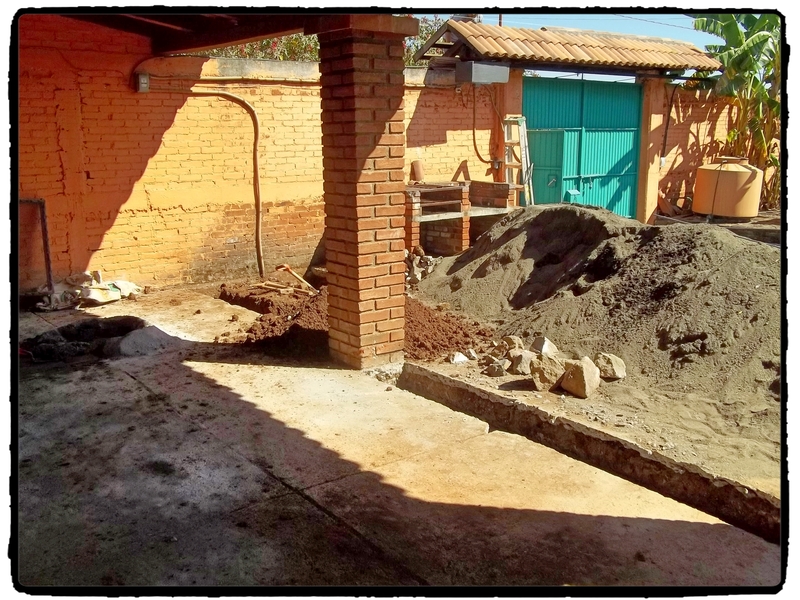 Filling in much of the trenches with rocks is cheaper than making it all concrete. The cement will be poured in after the rocks. This is what I remember from seeing this done elsewhere, including back when the Hacienda was built. Maybe I should get an option on the storefront. Perhaps, the highlands office of Mexpatriate? Señor Cotton: For you, a special price, the Gringo price. In other words, double.